Kingston Times: A parking lot. A floating storage facility. A catastrophe waiting to happen. A tourism killer. Those are but a few of the choice descriptions offered Friday, Aug. 19 at a press conference by opponents of a request for 10 new anchorages outside Hudson River communities including Kingston, Highland, Milton, Port Ewen and Newburgh and going all the way south to Yonkers. The request for the anchorages, which includes 43 berths, was made last January by the private maritime industry to the U.S. Coast Guard, which has jurisdiction over the waterway. Some of those anchorages would be able to accommodate tankers as long as two football fields. 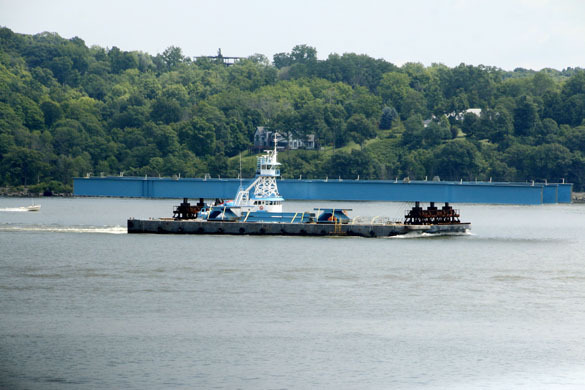 In a letter of support written earlier this month, the Maritime Association of the Port of NY/NJ cited historical precedent and claimed the anchorages would be safer and greener than either rail, truck or pipeline transport. The river has served as a “commerce viaduct” for centuries, the association’s executive director Edward Kelly said in a letter of support to the Coast Guard. The anchorages, he said, were the most environmentally sustainable way to transport oil products, since it would reduce wear and tear on roads and bridges and keep hazardous cargo outside heavily populated areas. The Maritime Association, which describes its mission as “to promote and represent the interests of tug boat operators and harbor carriers in local issues relevant to the tug and barge industry,” came up with the plan after the Coast Guard last fall issued a warning to barge operators to not anchor outside the currently allowed zones at risk of a $40,000-per-incident fine. But on the 19th, the Coast Guard got a shipload of arguments against the request. Standing on a reclaimed Beacon dock, while behind them kayakers and crab fishermen plied the river’s lapping waters, local town and city officials and environmentalists roundly condemned the proposal. Read more.